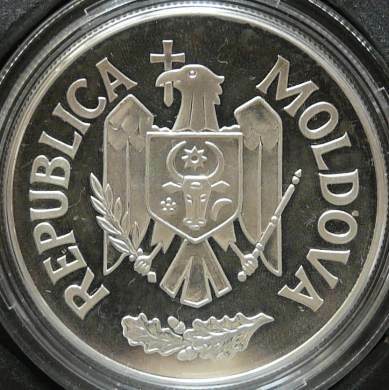 This is the first anniversary coin issued by the Republic of Moldavia. The coin was struck by the Royal Mint, in Llantrisant (Wales). Accordingly to the coin's pamphlet, the maximum mintage was 20.000 coins. Accordingly to unofficial information, 2.000 pieces only were struck. 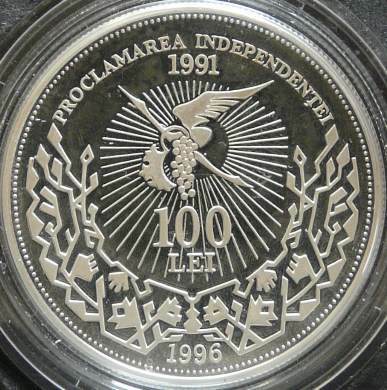 The Republic of Moldavia struck coins also for the 10th anniversary, for the 15th anniversary and for the 20th anniversary of the proclamation of the independence. The flying white stork with grapes in beak is one of the today's Republic of Moldavia symbols. The legend said that in the times of Stephen the Great and the Holy some Moldavian soldiers were besieged by the Turks in the fortress of Soroca. After several days the food stocks were finished and the warriors were in danger not to be able to continue the fight. A white stork flying over the fortress dropped the grape carried in its beak, and then many other grapes. With this unexpected help, the Moldavian fighters regained their strength and the hope for victory, attacking and defeating the Turks.